For other uses, see O'Neill (disambiguation). The O'Neill dynasty (Irish: Ó Néill) is a group of families, ultimately all of Irish Gaelic origin, that have held prominent positions and titles in Ireland and elsewhere. As Chiefs of Cenél nEógain, they are historically the most prominent family of the Northern Uí Néill, along with the O'Donnell and O'Doherty. The O'Neills hold that their ancestors were Kings of Ailech during the Early Middle Ages, as descendants of Niall of the Nine Hostages. A number of their progenitors and members are named as High Kings of Ireland, such as Niall Glúndub (from whom they take their name) and Domnall ua Néill. From 1185 until 1616, the O'Neills were sovereign Kings of Tír Eógain, holding territories in the north of Ireland; particularly around what is today County Tyrone. After their realm was merged with the Kingdom of Ireland and the land was caught up in the Plantation of Ulster, they were involved in a number of significant events, such as Tyrone's Rebellion, the Flight of the Earls, the Irish Rebellion of 1641 and the Irish Confederate Wars. The O'Neill clan claims descent from Niall Glúndub, a 10th-century king of Ailech as well as High King of Ireland. Niall descended from the Cenél nEógain branch of the Northern Uí Néill. The first to adopt the patronymic surname was Niall Glúndub's great-great-grandson, Flaithbertach Ua Néill. The O'Neill clan does not receive a mention in recorded history until 1160, from which they emerge from a "very murky background". In 1167 the high-king of Ireland, Ruaidri Ua Concobhair marched north and divided the kingdom of Tír Eoghain into two. The portion north of Slieve Gallion, was given to Niall Mac Lochlainn (McLaughlin), with the portion south of Slieve Gallion, given to Áed Ua Néill. After this the two rival clans contested for control over Tír Eoghain until the battle of Caimeirge in 1241, where the O'Neills wiped out the MacLaughlins. Once the MacLaughlins were defeated, the O'Neills spread out and slowly dominated the other client clans across Ulster and the other Irish kingdoms. They used the disruption of the Norman invasion of Ireland in 1169 to their benefit and were able to consolidate their hold on the western half of Ulster. The Bruce Invasion of Ireland devastated the Norman Earldom of Ulster, which held sway over eastern Ulster and most of its north coast all the way to Derry. Its collapse in 1333 allowed a branch of the O'Neills that had been on good terms with the Normans, the Clandeboy O'Neills, to step into the power vacuum and take control over large parts of eastern Ulster. The dominant Gaelic and Anglo-Irish leaders were in tune with their contemporary peers of the Middle Ages in terms of education, international trade, and diplomacy. The O'Neills of Tyrone had strong family relationships with the FitzGerald dynasty, both the Earls of Kildare and Earls of Desmond; the Earl of Pembroke via de Clare's marriage to the Irish house of Diarmuid, King of Leinster; and the MacDonnells, Bissetts, MacLeans, and Campbells. In 1171, King Henry II of England came to Ireland to remove the authority of the Norman lords in Ireland. He met the leading Irish kings and received the pledge of fealty from them. During the Middle Ages, the O'Neills of Tyrone were active politically and militarily throughout Ireland, occasionally sending nobility to fight within Ireland and in campaigns in Europe. From 1312 to 1318, the O'Neill kings were staunch supporters of King Robert the Bruce and his brother Edward Bruce in their struggle for Scottish independence. They sent troops and supported Edward in his attempt to become King of Ireland in 1315. In 1394 Richard II of England deemed King Niall Mor "Le Grand O'Neill" upon a friendly hosting of the two kings. In the 14th century Edward III of England called Tyrone "the Great O'Neill" and invited him to join a campaign against the Scots, and another O'Neill prince accompanied the English king on a crusade to the Holy Land. In 1493, Henry VIII of England referred to Henry O'Neill, King of Tyrone, as "the Chief of the Irish Kings" and gave him a gift of livery. The O'Neills' independent stature within Ulster began to change with the ascent of King Henry VIII in England in 1509. Soon after he took the English throne, Henry decided to grasp Ireland via a reputed Papal Bull that claimed to grant the lordship of Ireland to English kings. This was spurred by the 1547 Rising of Silken Thomas Fitzgerald. The O'Neills supported their FitzGerald dynasty cousins in that rebellion and had to maneuver politically to keep the English from toppling their power in Ulster when the rising failed. Henry began a policy to reduce the kings in Ireland to the same rank and structure as the English nobility. In the policy called Surrender and regrant Irish monarchs were forced to surrender their titles and independent lands to Henry, and in return he created them Earls of the Kingdom of Ireland and "granted" them their own lands back. The last King of Tyrone and first original earldom was one such grant by Henry VIII in 1542 to Conn Bacach O'Neill, on the creation of the Kingdom of Ireland. The submission of Conn O'Neill led to a 50-year civil war within Ulster that eventually led to downfall of O'Neill power in 1607 with the departure of the third earl for Rome and exile. Shane an Diomais (1530–1567), the eldest surviving, legitimate son of Conn Bacach O'Neill, was styled Prince of Tyrone, Prince of Ulster, and Dux Hibernicorum (Prince of Ireland) by his European peers. He did not share the moderate relationship with the English that his father had cultivated. He was almost always at war with the Lord Lieutenant in Dublin. An act of the English Parliament in 1562 gave Shane O'Neill the English title of Lord O'Neill until his claim for his father's estate was settled. The writ for Shane to be named the second Earl of Tyrone was written, but held up on Dublin. Shane rebelled and was killed before he could be invested and in 1569, the retrospective attainder of Shane O'Neill banned the use of the title of The O'Neill Mór. The title The O'Neill Mór was not a patrilineal hereditary one, but was conferred on the man elected and inaugurated to rule Tír Eoghain. The title does not have to be from a Tyrone sept, as at least two Clannaboy chiefs also served as The O'Neill Mór. However, there are a few families that may, and some do, claim the rights of O'Neill of Tyrone. These claimants are made up of descendants of the last King and sons of the first Earl (Conn O'Neill, 1st Earl of Tyrone): Shane an Diomais (Shane O'Neill), Ferdocha (Mathew) O'Neill, and Phelim Caoch O'Neill. These claimants include O'Neill of Corab, O'Neill of Waterford, McShane-Johnson O’Neills of Killetragh, and O’Neill of Dundalk, as well as the primogeniture of the Marqués de Larraín who still use the titular title of Prince of Tyrone. All descend from one of the last chiefs of the O'Neills of Tyrone. Hugh O'Neill, Earl of Tyrone, continued to use his title after he fled to the Continent in the Flight of the Earls, although in the law of the Kingdom of Ireland it was forfeit by act of the Irish Parliament a year later. So did his son Shane O'Neill, whose will left his title to his only, if illegitimate, son Hugo Eugenio O'Neill; he died young, and other Spanish O'Neills continued to use the title through the seventeenth century. The barony of Dungannon was created in 1542 as the title designated for the declared heir of the Earldom. Ferdocha or Mathew O'Neill, natural son of Conn Bacach the 1st Earl, was the first to hold the title of Baron Dungannon. The line that descended from Mathew kept the Baron of Dungannon as one of its junior titles at least through the death of Don Eugenio O'Neill, Conde de Tiron in 1695. There were other titles laid out in the will of Don Juan (John/Shane/Sean) O'Neill, Earl of Tyrone in 1660. They include: Viscount of Tyrone, Viscount of Montoy, Baron of Strabane, and Lord of the Clannaboy. There is a later account of the O'Neills acquiring the comital title of Clanawley. Although the title of Baron of Dungannon would traditionally still be preserved with the title of Count/Earl of Tyrone, it is not presently used by anyone in the extended O'Neill family. Another of the more famous O'Neills of Tyrone was Eoghan Rua Ó Néill, anglicized as Owen Roe O'Neill (c. 1590–1649), a brilliant 17th-century military commander and one of the most famous of the O'Neill family of Ulster. He was the son of Art O'Neill, a younger brother of Hugh O'Neill, 2nd Earl of Tyrone. As a young man, he left Ireland in the Flight of the Earls to escape the English conquest of his native Ulster. He grew up in the Spanish Netherlands and spent 40 years serving in the Irish regiment of the Spanish Army, mainly in the Eighty Years' War against the Dutch Republic in Flanders, notably at the siege of Arras, where he commanded the Spanish garrison. O'Neill was, like many Gaelic Irish officers in the Spanish service, hostile to the English Protestant invasion of Ireland. He returned to Ireland during the Irish Rebellion of 1641 to command the Catholic Army for during the Irish Confederate Wars. He was reportedly poisoned by Cromwell's supporters and died in 1649. The Slight-Arte O'Neills This is another branch of the Tyrone O'Neills which started in the mid 15th century. The name translates to "of the sept of Art". Eoghan Mór O'Neill (Owen the Great), King of Tír Eoghan (Tyrone) from 1432 to 1456 had four sons who each started independent lines. His eldest, Henry, was King of Tyrone from 1455 to 1489 and was the grandfather of Conn Bacach. Aodh, his second son started the line of the Fews. Art, his third son, was King of Tyrone 1509–1514. This branch of the family held its lands in western Tyrone and was typically at a distance from those O'Neills centered on the traditional capitol of Dungannon. Art was unable to elevate his son to the kingship, but his grandson was Sir Turlough Luineach Ó Neill, The O'Neill Mor 1567–1593, the Earl of ClanConnell, and de jure King of Tyrone for a rocky period during the 1570s. On his deathbed he passed his chiefship to his cousin Hugh Mór O'Neill, the Earl of Tyrone. That family, after Sir Turlough's death, remained hostile to the Earl and often sided with the English when in conflict with the rest of the Tyrone O'Neills. Aodh Buidhe, son of Domhnall Óc Ó Néill, grandson of Aodh Meith O'Neill (Hugh the Fat), and great-gransdon of Áed in Macáem Tóinlesc, all kings of Cenél nEógain of the Northern Uí Néill, was the eponymous ancestor of the Ó Néill Cloinne Aodha Buidhe, or Clanaboy Ó Néill, line. He had come to an arrangement with the Norman Earls of Ulster which allowed his sons, particularly Briain, to consolidate Ó Néill power within The North at the expense of the O'Donnells. Aodh Buidhe was married Eleanor de Nangle, a kinswoman to his nominal enemy, Walter de Burgh, the Earl of Ulster and Jocelyn de Angulo; Aodh died in 1283. The lineage he established remained senior among the Ó Néill's, becoming semi-independent with a distinct territory. Having helped the Anglo-Normans barons in a rebellion against their fellow Norman lord, the Earl of Ulster, the family was granted land outside The North, in Ulster within what is now south County Antrim. That was the official establishment of the Lordship of Cloinne Aodha Buidhe, or the O'Neills of Clandeboye, though the English retained lordship over the much-reduced Earldom of Ulster. The family fought on both sides of the wars that racked Ireland from the 1530s to 1690s, whose end result was a significant loss of territory and influence due to political alliances and an influx of new families flowing in from Scotland and England. In the beginning of the 18th century Féilim Ó Néill (in English Felix O'Neill), senior male in linear descent of the line of Brian Ballach Ó Néill, Niall Mór Ó Néill's second eldest son, was dispossessed of all his estate through the confiscation applied via the Penal Laws, which led him to emigrate to France. He was a cavalry officer who took part in many battles with the heroic Irish Brigade of the French Army. He fought with the French against the British, the Austrians, and the Dutch (during the War of the Spanish Succession), in the celebrated Battle of Malplaquet, where he died on 11 September 1709. His son Conn (Constantine) O'Neill was an officer who spent his life in exile in France and married to Cecilia O'Hanlon. Their eldest son, João O'Neill (Shane O'Neill), was born in Richhill Village in the parish of Kilmore, Tyrone, and died in Santos o Velho, Lisbon, on 21 January 1788. He left France with his brothers and established their noble line permanently under in the Kingdom of Portugal. He was the titular head of the Clanaboy O'Neill dynasty, whose family have been in Portugal ever since. The current head of the Clanaboy O'Neill dynasty, a descendant of João, is Portuguese nobleman Hugo Ricciardi O'Neill, the son of Jorge Maria O'Neill; the family has been remarkable in the modern history of Portugal. The issue of Sir Henry Ó Néill, who had been "granted" the Edendubhcarrig estate and majority of the Cloinne Aodha Buidhe lands by conforming to English ways and converting to Anglicanism, died out in 1855. At this time, the barrister Charles Henry Ó Néill of the Ó Néills of the Feeva, descendant of the last Tánaiste of Clanaboy, Sir Henry's uncle Con Mac Brian Ó Néill, became officially recognised as The Ó Néill Clanaboy. "The descendants of Prince Con MacBryan O'Neill, Tanist of Clanaboy, remained loyal, under every viccissitude, to the traditions of their house, and saved little out of the general wreck of confiscation. They seemed to have preferred fulfilling the solemn pledge of their ancestor, Donald O'Neill, King of Ulster, to 'fight out as long as life should last' rather than adapt themselves to altered circumstances, as the descendants of Shane MacBryan had wisely done," according to Burke's Peerage. In fact both Sir Henry and his daughter Rose willed the Shane's Castle estate to the descendants of Prince Con mac Brian. While Charles Henry assumed the title, the Clanaboy Ó Néill estate was passed to William Chichester through his grandmother Mary Ó Néill – a move highly disputed. Charles Henry Ó Néill had his first and only child, a daughter named Elizabeth Catherine Theresa Mary Ó Néill, in 1845, during the Great Hunger, and had no further issue. From the death of Charles Henry Ó Néill until Hugo Ricciardi O'Neill assumed the chieftainship the family had no chief. Hugo Ricciardi O'Neill is officially recognized by the offices of arms throughout Europe as titular Prince and Count of Clanaboy. He uses the title and style of The O'Neill of Clanaboy. The name Clanaboy (or Clandeboye) is a corruption of the Gaelic family name of 'Cloinne Aodha Buidhe' or 'Family of Fair-Haired Hugh'. The O'Neills of Bellaghy are of this line. Count O'Nelley of the Austro-Hungarian Army (circa 1750) is of this line, as are the O'Neills of the Feeva. The traditional title of the head of this family branch is The O'Neill Buidhe or The O'Neill of Clannabuidhe. The O'Neill of Clanaboy is the only O'Neill prince recognized as one of the hereditary Chiefs of the Name of Ireland. They are a dominant family to this day in Counties Antrim, Louth, and eastern Armagh. "The Fews" (Irish: na Feadha) is an area in County Armagh that was a sub-territory under the O'Neills of Tyrone and is roughly equivalent to the area of the parish of Creggan. This O'Neill branch is related to the O'Neill of Tyrone through King Eoghan Mor, circa 1432–1436. The king's younger son Aodh (Hugh) pushed in the territory known as the Fews and conquered its various independent lordships. Aodh then established an independent chieftainship under his father and then brother. In the rebellion of 1642, Sir Henry O'Neill, a member of the Fews O'Neills, sided with the English crown while his sons and brothers played a prominent part in the rising. Despite his choice of sides his lands were confiscated and divided among a number of Cromwellian settlers. The chief beneficiary was Thomas Ball, whose grants totalled more than 6,000 acres (24 km2). Sir Henry O'Neill was banished to Connacht, to land in County Mayo, Ireland. Exiled with him was his son Captain Sean/Shane O'Neill. Shane's sons took the surname MacShane, or son of Shane. His grandson William anglicized the name to Johnson. He was a major-general in the American Colonial Army and fought the French at Niagara, New York in French-Indian War. For his significant victory he was granted a baronetcy and made Sir William Johnson, 1st Baronet of New York in 1753. The present holder of that estate is Sir Colpoys Johnson, 8th Baronet of New York. When the Williamite War began in Ireland in 1689, Sir Henry O'Neill's son Turlough was dead and so was Turlough's son Con. The heir to the family’s Mayo estate was Con's son Henry, who was a minor and had been sent to France for his education. Despite their non-participation in the war, the O'Neill estates were seized by the Crown. Henry (1676-1745) should subsequently have recovered the confiscated lands; his relatives on the continent feared to send him back to Ireland to stake his claim and the property went by default and was sold in 1702-3. Henry had a heroic career in the French army, rising to become a Lieutenant-Colonel in the Regiment of Clare. He was killed at the Battle of Fontenoy in May 1745, aged 69. Henry was the last undisputed claimant to the lordship of the Fews. Some O'Neill families today claim descent from this Henry O'Neill, but contemporary documentation show that he died without any leaving any descendants. Following Henry’s death, Felix O'Neill (c1720-1792) was identified by contemporaries as the "person to whom the Lordship of the Fews in the North of Ireland in right and justice belongeth". Indeed, Felix was considered to have a valid claim to be the Chief of the entire O’Neill clan. In his book "History of Ireland" (1758–62) Abbé James MacGeoghegan of the Irish College in Paris wrote of the house of the O'Neills that "the present representative is Felix O'Neill, the chief of the house of the Fews, and an officer of rank in the service of his Catholic Majesty". Felix O'Neill was born in Creggan in County Armagh. He descended from Aodh Buidhe O'Neill, brother of Sir Henry O'Neill. Felix left Ireland for a career in the Spanish Army and is well remembered for his rescue of Charles Edward Stuart ("Bonnie Prince Charlie") following the Battle of Culloden. Felix became a lieutenant general in the Spanish Army and his four sons in turn all had honourable careers in the Spanish military. While most of them did not marry and have families, the youngest son Juan O'Neill (1768-1809) married Vincenta Gual y Vives de Cananas from Palma, Mallorca, and took up residence on the island. Having attained the rank of Captain-General, he died aged 40 leaving a son Felix who was only a year old. Through this man the O'Neills of the Fews line continued in Mallorca in the 19th century and in Argentina in the 20th century. The current day Argentinean descendants of Lieutenant General Felix O'Neill therefore have an historical claim to be leaders of this branch of the O'Neill dynasty. A contrary claim to the leadership of the dynasty comes from Spanish nobleman Don Carlos O'Neill, 12th Marquis de la Granja, who has been described as "the Prince of the Fews". He claims direct descent from the last undisputed "Lord of the Fews" Henry O’Neill although contemporary evidence shows that Henry had no descendants. While the family's precise link to the historical O'Neills of the Fews therefore remains unclear, their descent can be traced back to a certain 'Red' Henry O'Neill and his wife Hanna née O'Kelly, the daughter of counselor John O'Kelly of Keenagh, County Roscommon, whose children relocated to Spain in the 1750s and 1760s. Henry and Hanna O'Neill became the parents of Arthur O'Neill in 1736. He was born in Dublin, Ireland. He joined the Spanish army in 1752 and was known by the name Don Arturo O'Neill de Tyrone. He served over 20 years in the Spanish colonial service, becoming Governor of Yucatan in October 1792, and later Governor of West Florida. On his return to Spain in 1803 he was appointed to the Supreme Council of War (replacing Governor Miguel de Uztaraiz) and was awarded the title of the 1st Marques Del Norte two years later. Arturo's brothers included Lieutenant-Colonel Niall 'Nicolas' O'Neill y O'Kelly who died at Zaragoza in Spain, and Tulio and Enrique O'Neill y O'Kelly who both relocated to the Caribbean island of St. Croix in the footsteps of a deceased uncle. These two brothers were granted a license by the Spanish crown to create sugar plantations on the island of Puerto Rico in 1783, although they never availed of it. Tulio O'Neill y O'Kelly married Catherine O'Keefe y Whalen and became the parents of Arturo O'Neill y O'Keefe and Tulio O'Neill y O'Keefe. Don Arturo O'Neill y O'Keefe was born in March 1782 on St. Croix and married Joanna Chabert Heyliger there in April 1802. Arturo and his brother pleaded for permission to take up their father's right to land in Puerto Rico and this was granted in 1804. Arturo moved his family there in March 1810 and his descendants continue to reside there today as well as in Spain and the USA. Arturo became a Lieutenant Colonel on 17 August 1828 in Bayamón, Puerto Rico and inherited the title of Marques Del Norte from his uncle. He died on 7 September 1832 and is reportedly buried in the Roman Catholic Church of Frederiksted, Saint Croix. Don Tulio O'Neill y O'Keefe was born on St. Croix in September 1784. He became a General in the Spanish army and won distinctions during the Peninsular War fighting the French. He married Manuela de Castilla Quevedo, the daughter of a Spanish noble family, in 1819. However she died shortly after the birth of their son, Don Juan Antonio Luis O'Neill de Castilla. Tulio was promoted to Field Marshal in charge of the Royal Guard in 1828 and it was he who made the public announcement of the birth of a daughter to the King in 1830, namely the future Isabel II of Spain. Tulio died in 1855 and the family line was continued through his son who inherited his mother's titles (the Marques de la Granja, the Marques de Caltojar, the Marques de Valdeosera and the Count of Benajiar). A later descendant of his also took the title of Marques Del Norte that had remained unclaimed by their relations in Puerto Rico. This branch of the family is often referred to as the O'Neills of the Fews of Seville and is currently headed by the Spanish nobleman Don Carlos O'Neill. Any claim of theirs to represent the O'Neills of the Fews dynasty however must be viewed in light of their descent from the junior branch of the O'Neill y O'Keefe family as well as the absence of a proven lineage linking to the historical "Lords of the Fews". The sept of MacShane is a closely related branch of the Tyrone O'Neills. When Shane an Diomais O'Neill, Prince of Tyrone and chief of all the O'Neill clans, was killed in 1567, he had an estimated ten male children from his various wives and mistresses. As a group they were very young. During Shane's lifetime, he made claim to the patrimony of these children and thus they were raised in the courts of their various maternal grandfathers and aunts upon his death. These houses included the Gaelic noble families of O'Donnell, Maguire, O'Quinn, MacDonald, and MacLean. Sixteen years later in 1583 a confederation of the brothers met at the court of their uncle, the Chief of the MacLean clan in the Scottish isles. They were given an army of more than 2000 Scots to return to Ulster to attempt to retake their father's estate and title. When they invaded the brothers took the English and the O'Neill chiefs by surprise and created a large sphere of control in eastern Ulster, allied with the MacDonald's of Antrim. In an attempt to characterize them, the English began to refer to the group of brothers as "the Mac-Shanes" which in Gaelic meant "the sons of Shane O'Neill". For seven years they battled Sir Turlough O'Neill, the recognized O'Neill Mor at the time, and the rising Baron Dungannon and eventually Earl of Tyrone, Hugh Rua O'Neill. The brothers were dealt a blow in 1590 when the Earl of Tyrone captured and hanged three of the men. The earl succeeded in capturing and imprisoning another three over the remainder of the decade until there were only two possibly three of the brothers and nephews hiding out in the Glenconkeyne forest in eastern Tyrone. Two sons of Con MacShane O'Neill, Hugh and Ever, became warriors within the O'Neill clan living there. That family had saved them as babies when their father had been killed nearby and had since been referred to as the Clan Shanes. In 1593, the Earl of Tyrone had the Clan Shane's chief killed and the family turned to Hugh MacShane as their new leader. Hugh was elected as their chief, and that O'Neill branch has since forth taken on the "MacShane" surname as an honorific for their loyalty to Shane O'Neill and to his battling sons. Hugh McShane O'Neill reigned as chief until 1622 and his sons and grandsons served as the chieftains of the family and were active in the wars and politics of Ulster, Ireland, and Spain for the next two centuries. Some of Shane's surviving son's were given land after the flight of the earls that had previously belonged to Hugh O'Neill. Henry was given land in Orior, Con was given the estate of Clabbye, and Brian was given land in Clinawly, Fermanagh. Brian's son Edmond was granted control of Lisdawericke, Megin, Cnoghan, Tollohiny Dirrilghta, Knockmcgallcrum & Gortnesillagh. Henry's son Cormocke (Cormac) was given land. This would spread the clan throughout the province. When the family had been "attainted" as Irish Jacobites in the 1690s, the heir, Owen McShane, completely dropped any association with the O'Neill name in an attempt to hold his father's small estate. The Penal Laws and the influx of Scottish and English invaders into Ulster made it increasingly difficult for the Gaelic Irish to hold position and land within Irish society, and so the name MacShane was eventually shortened to McShane, and then during the 18th and early 19th centuries, to the English "Johnson", as their relation, Sir William Johnson had done in 1720. Johnson, and to a lesser extent Johnston, was commonly used in counties Tyrone, Londonderry and Armagh until the 1920s. Over the 20th century, many of the Irish branches returned to the Gaelic name. This family is still active and viable in Ulster, America, and Australia. The family leadership today is directly descended from Hugh MacShane and is closely involved in the greater O'Neill clan activities and their present head takes part in the Association of O'Neill Clans and is on the O'Neill family council. Many O'Neills moved to the Caribbean, especially from the lines of the Counts of Tyrone of Hugh MacFerdorcha Aodh Mór mac Feardorcha Ó Néill. Their close connection to the Spanish government after the final fall of the O'Neills in 1690 provided the opportunity for new territory. Family documents that the O’Neill's had elements land on the Islands and were associated with the families of Rocco, Eammon, Constatino or Conn Eoghan, Edmundo, and Gill – all men who served in the Ultonia and Hibernia regiments for the Crown of Spain. Recent findings show that other O'Neill's settled in Puerto Rico in the 18th century. The earliest record, based on documents from the Spanish royal courts, show that Don Juan O'Neill arrived in Puerto Rico in the 1710s. Two O'Neill officers served in the Spanish Army forces of Bernardo de Galvez fighting the English in Florida and Alabama during the American Revolution. Tulio and Enrique O'Neill y O'Kelly, of the O'Neills of the Fews, became residents of St. Croix in the 1770s in the footsteps of a deceased uncle. Tulio's sons, Arturo and Tulio O'Neill y O'Keefe, were granted land in Puerto Rico in 1804. Arturo moved his family there in March 1810 and his descendants continue to reside there today as well as in Spain and the USA. Most O'Neill families of Puerto Rico have for many generations resided in the districts of Hato Nuevo, Mamey, and Sonadora of the city of Guaynabo on the northern coast of the island of Puerto Rico. Other O'Neill families have settled in the cities of Río Piedras and Caguas. Many other O'Neill families that moved from Barbados settled on the Island of Vieques. The O'Neills have been mayors of their cities. The O'Neills of Martinique settled in the early 1700s; in the next century, they claimed to be Count of Tyrone and lineally descended from Hugh O'Neill, Earl of Tyrone. This claim (which rested on a single-sentence document in their own possession) is currently regarded as unproven. The main stem of this family is now extinct in the male line; collateral descendants may exist. Today the ancient O'Neills still flourish in Ireland, Europe, and the New World. There are the three ancient O'Neill dynasties or principalities, each of which are still represented by direct descendants of the once independent kings. The original titles passed under the elective derbfine system of Irish Brehon law. Incumbents were then granted further titles that are inherited under primogeniture by various Roman Catholic kingdoms in Europe and today are titled O'Neills in Ireland, Spain, France, Scotland, Portugal, England, Australia, South Africa and the Americas. The South African descendants are referred to as Nel's, mainly due to the influence of the Afrikaner people of the country. The family maintains a loose confederation of its sept princes centred in Ireland, which meets annually. The group met in 2010 outside Paris, France to announce a new, global clan organization that has as its goal the construction of an O'Neill museum to be built in Ulster as a central repository for all the family artifacts spread across the world. A library at that museum will open historical writings that have been in private hands out of Ireland for centuries. It is a common misconception that there is one coat of arms associated to everyone of a common surname, when, in fact, a coat of arms is property passed through direct lineage. This means that there are numerous families of O'Neill under various spellings that are related, but because they are not the direct descendants of an O'Neill that owned an armorial device do not have rights or claims to any arms themselves. 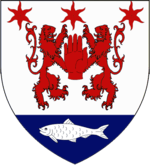 The coat of arms of the O'Neills of Ulster, the branch that held the title of High Kings of Ireland, were white with a red left hand (latterly, the Red Hand of Ulster), and it is because of this prominence that the red hand (though a right hand is used today, rather than the left used by the high kings) has also become a symbol of Ireland, Ulster, Tyrone and other places associated with the family of O'Neills. 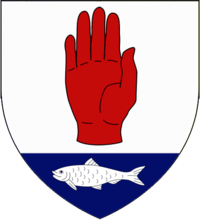 The red hand by itself has become a symbol of the O'Neill name, such that when other O'Neill family branches were granted or assumed a heraldic achievement, this red hand was often incorporated into the new coat of arms in some way. The red hand is explained by several legends, with a common theme but of a promise of land to the first man to sail or swim across the sea and touch the shores of Ireland. Many contenders arrive, including a man named O'Neill, who begins to fall behind the others. O'Neill cuts off his left hand and throws it onto the beach before the other challengers can reach the shore, becoming the first to touch land and win all of Ireland as his prize. These legends seem to originate (or to have been written down) in the 17th century, centuries after the red hand device was first used by O'Neill families. Several Scottish families may descend from an O'Neill dynast named Anradhán. According to Leabhar Chlainne Suibhne, Anradhán, son of Aodh Athlamháin, quarrelled with his elder brother, Domhnall, ancestor of the O'Neills, and left Ireland for Scotland. This source states that Anradhán won extensive lands by conquest, and married the daughter of the King of Scots. Anradhán, who does not appear in contemporary sources, was apparently an 11th-century dynast, son of Aodh Athlamháin, King of Aileach (died 1033). Although Leabhar Chlainne Suibhne states that Anradhán gained his lands through conflict, it is possible that he secured these lands in Argyll through marriage to their heiress. Leabhar Chlainne Suibhne, Dubhaltach Mac Fhirbhisigh's genealogies, and Cú Choigcríche Ó Cléirigh's pedigrees specifically state that the MacSweens were descended from Anradhán. According to Mac Fhirbhisigh's genealogies, Ó Cléirigh's pedigrees, and MS 1467, the Lamonts were also descendants. MacLachlans were also descendants, according to Ó Cléirigh's pedigrees and MS 1467. According to MS 1467, the MacSorleys of Monydrain, and MacEwens of Otter are also descendants. The Gilchrists appear to be another family descended from Anradhán. The original Gaelic surname of the Highland Livingstones suggests that they were also descendants. There is uncertainty regarding the ancestry of the MacNeills. The family of Barra may well be unrelated to the family of Taynish and Gigha. It is uncertain if either family descended from Anradhán, although tradition dating to the turn of the twentieth century suggests that the Barra family may have. ↑ Eric Beerman (July 1981). "Arturo O'Neill: First Governor of West Florida during the Second Spanish Period". The Florida Historical Quarterly. 60 (1): 29–41. JSTOR 30148550. ↑ "Ó Néill". Sloinne. 5 December 2015. 1 2 3 4 Art Cosgrove (2008); "A New History of Ireland, Volume II: Medieval Ireland 1169-1534". Oxford University Press. ↑ Sean Duffy (ed.). Medieval Ireland, an Encyclopedia. ↑ Micheline Kearney Walsh (1988). "The Last Earls of Tyrone in Spain". Seanchas Ardmhacha: Journal of the Armagh Diocesan Historical Society. 13 (1): 33–58. The last mention of a Conde de Tyrone is in 1691, and Walsh concludes that he died not long thereafter. ↑ Burke, Sir John Bernard (1860). A selection of arms authorized by the laws of heraldry. Harrison. ↑ Ó Fiaich, Tomás (1974). "The O'Neills of the Fews". Seanchas Ard Mhacha. 7 (2): 276. ↑ Ó Fiaich, Tomás (1974). "The O'Neills of the Fews". Seanchas Ard Mhacha. 7 (2): 296. ↑ Henry, Mark (2013). "The O'Neills of the Fews: new findings concerning the historical O'Neill family and their present day lineage". Seanchas Ard Mhacha. 24 (2): 60. 1 2 Henry, Mark (2015). "The O'Neills of the Fews: their origin, descendants and DNA profile: I". The Irish Genealogist. 14 (2): 173–174. ↑ O'Neill, Widow (1751). A letter seeking support for inheriting her husband's estates. British Library Add MS 32826. pp. Folios 5–8. ↑ O'Neill, Felix. "Summary biography". ↑ O’Doran, Edmund (1746). Letter to the secretary of King James III. Windsor, England: Royal Archives, Stuart Papers. p. SP/MAIN/279/72. ↑ O’Kelly, Patrick (1844). The History of Ireland Ancient and Modern taken from the most authentic records and dedicated to the Irish Brigade by the Abbe MacGeoghegan. p. 250. ↑ KerneyWalsh, Micheline (1957). The O’Neills in Spain. ↑ Henry, Mark (2013). "The O'Neills of the Fews: new findings concerning the historical O'Neill family and their present day lineage". Seanchas Ard Mhacha. 24 (2): 90–93. ↑ Henry, Mark (2015). "The O'Neills of the Fews: their origin, descendants and DNA profile: I". The Irish Genealogist. 14 (2): 174–176. ↑ Henry, Mark (2015). "The O'Neills of the Fews: their origin, descendants and DNA profile: I". The Irish Genealogist. 14 (2): 176–182. ↑ Henry, Mark (2015). "The O'Neills of the Fews: their origin, descendants and DNA profile: I". The Irish Genealogist. 14 (2): 185–187. ↑ Henry, Mark (2015). "The O'Neills of the Fews: their origin, descendants and DNA profile: I". The Irish Genealogist. 14 (2): 188–189. ↑ Ó Fiaich, Tomás (1974). "The O'Neills of the Fews". Seanchas Ard Mhacha. 7 (2): 299. ↑ Henry, Mark (2015). "The O'Neills of the Fews: their origin, descendants and DNA profile: I". The Irish Genealogist. 14 (2): 179–189. ↑ "College of Arms FAQ". College-of-arms.gov.uk. Retrieved 11 March 2010. ↑ "About the name O'Neill". Araltas.com. Retrieved 11 March 2010. ↑ "Uí Néill". Encyclopedia.com. Retrieved 11 March 2010. ↑ Black (2013); Walsh (1920) pp. 2-5. 1 2 3 4 5 Sellar (1971). ↑ Black (2013); Sellar (1971); Pender (1951) pp. 23 (336), 39 (493); Walsh (1920) pp. 4–5. ↑ Black (2013); Black (2012); Sellar (1971); Pender (1951) pp. 21 (306), 45 (588). ↑ Black (2012); Sellar (1971); Pender (1951) p. 21 (307, 308). 1 2 Black (2012); Sellar (1971). The Wild Geese, Mark G. McLaughlin. Wild Geese in Spanish Flanders,1582–1700, B. Jennings. The General Armory of England, Scotland, and Wales, pg. 758. Calendar of the State Papers of Ireland 1660–1662, pg. 706, Edt by Robert Mahaffy, London, 1905. Black, R (2012). "1467 MS: MacSorleys of Monydrain". West Highland Notes & Queries (No. 20, series 3): 12–14. Black, R (2013). "1467 MS: The Lamonts". West Highland Notes & Queries (No. 21, series 3): 3–19. Pender, S, ed. (1951). "The O Clery Book of Genealogies: 23 D 17 (R.I.A.)". Analecta Hibernica. Irish Manuscripts Commission. Vo1. 18: 1–198. JSTOR 25511857 – via JSTOR. (subscription required (help)).